Presented in order of acquisition, not manufacture. 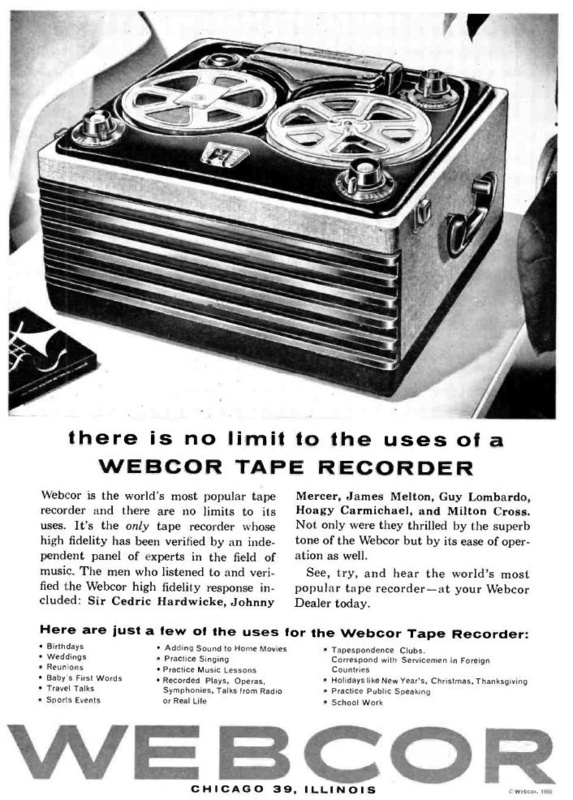 Early Webcor tape recorders just had model numbers, but in the late 50s they began giving them names. 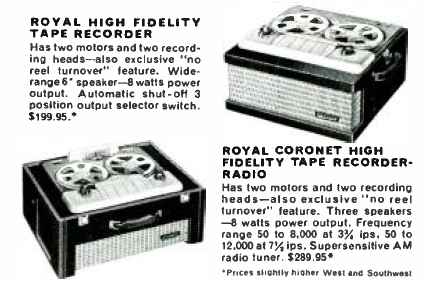 In 1957/58, when this machine was new, the top-end deluxe stereo model was the Imperial, the monoaural Royal Coronet was next, and my Royal was a half-step down from that. The difference between the Royal and Royal Coronet (models 2611 and 2612 respectively) is entirely due to the speakers. The Royal had one 9Ω speaker; the Royal Coronet had three 3.2Ω speakers. The Coronet's cabinet was a little larger to accomodate it, and it weighed in at 49 lbs, whereas my Royal is only 42 lbs. Otherwise they're identical. Check out the SAMS Photofact (S35 328, Folder 13) if you don't believe me. The dash number suffix is for the cabinet color and input supply voltage. -1 was black (Ebony) at 110V, -2 was tan at 110V. -3 and -4 are the same but run off 220V. So a long story shortened: I grew up in the era of 8-track tapes and cassettes, and like a lot of kids I started recording stuff off the radio, the tv (this was before VCRs), playing disc-jockey and the like. 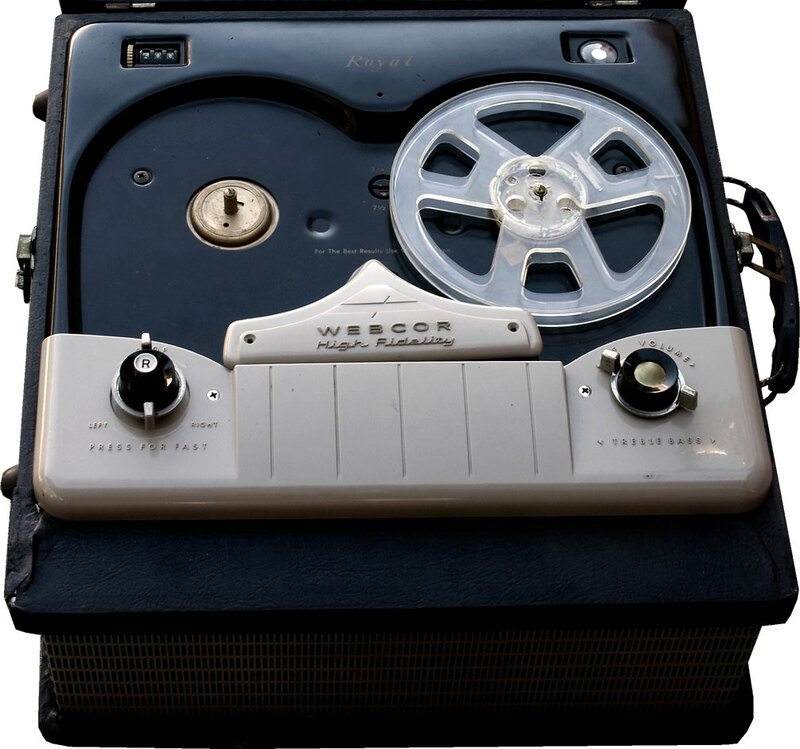 Finally The Old Man let me use his Wollensak reel recorder (see below). Reel recorders from the late 50s didn't have the dynamic audio range of even crappy 70s cassette recorders, but they were still a lot better in all sorts of ways. Maybe a year later I bought a Webcor 210 at a yard sale for $5, a 50lb luggable beast. The Old Man recapped it and got it going. 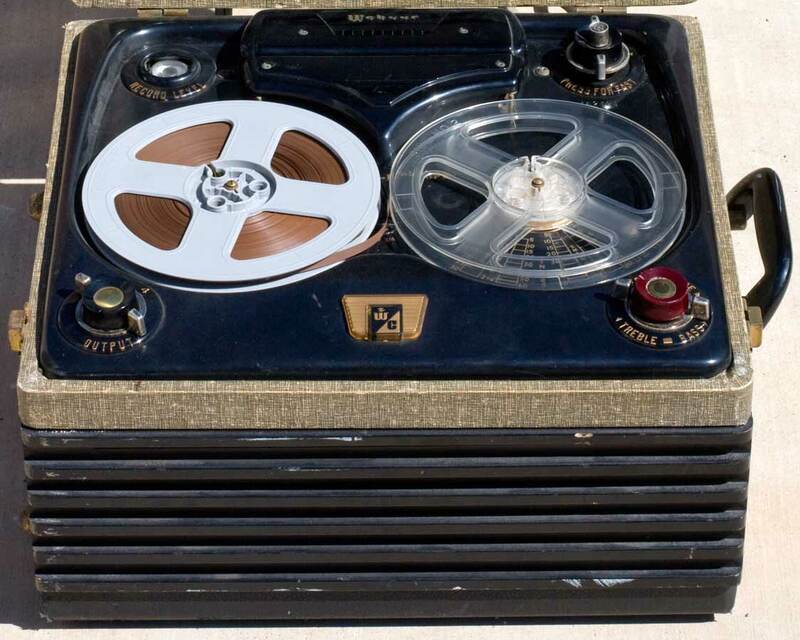 It was huge, a back-breaker, it was ½-track mono, with the audio frequency range of a 60-year-old man. But it was mine and I loved it. After that a few more passed in and out of our possession; somehow mine disappeared or was wrecked. When I stumbled across this Royal, also for $5, I grabbed it. It needs some TLC but it is still fundamentally sound. I doubt any of the people who built this machine honestly thought it would still be playing in the 21st century. I also bought it because it's the only machine I have that can handle ½-track recordings. ½-track is an early monoaural format where you split the tape lengthwise in half and record one track in each direction. When stereo came out they went to a 4-track system, two (left and right) in each direction. For mono systems, they simply laid both tracks with the same information and called it 2-track mono. Things would have been backward compatible if the two tracks (going in the same direction) were placed side-by-side, but noooo, they alternated them instead. So a ½-track machine can only play ½-track recordings; if you play a 2 or 4-track recording, it picks up one track going the proper direction and one track going backward, and plays them simultaneously. 4-track machines (and their 2-track mono versions) can theoretically play ½-track recordings by simply muting one channel or the other. In reality it never seems to work—either the machine doesn't have separate channel volume controls or the balance doesn't completely cut one channel, and there's also some kind of bleed-through. 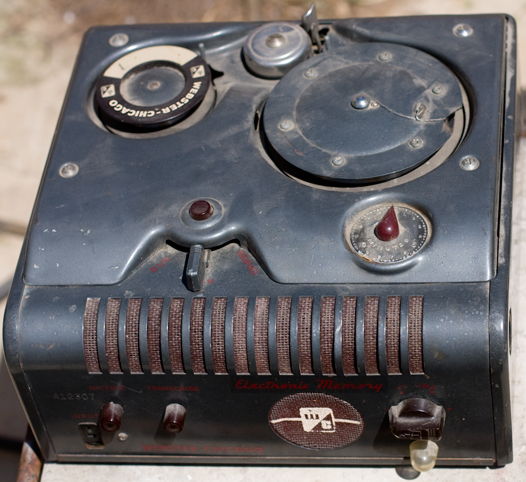 My opinion is if you want to play ½-track recordings, use a ½-track machine. Purchased for $10 from a thrift shop. I needed this one like I needed a third nostril, but this one looked at me like a sad animal at the dog pound. It looked too much like my old, original Webcor; it was cheap; and other than missing a knob, it was complete—it even had the microphone, which is often missing on these machines. Worse comes to worst, I could use it as a parts donor. Hell, it's worth $10 just for the magic eye. I was convinced when I picked it up that I'd have to pull it apart and recap it at the very least, but so far, nothing seems amiss. Every Webcor I've had has been so quiet you can't tell that they're running, and this was the same way. I didn't know it was working until I engaged the motor and it turned (in dimmer light I would have noticed the pilot light under the W/C logo in the front). A tape (in the photo) came with the machine so I tried it and it played. Tried recording—the magic eye is bright and working, but couldn't record. Not sure if the mic is bad or something else; sometime I'll try some other mics on it and see, but since I'll likely never record anything with it (all I want is playback), I'm not terribly motivated to check it out. Cosmetically it's also in good condition. It's got some scrapes and scratches, but the fabric is intact and not really fraying, which you can't say about a lot of machines from this era. The face plate and controls, like most Webcors I've seen, are almost pristine. Other than a missing knob (which I had from a scrapped-out machine), it's complete and in nice shape. Seriously, how can you not love these things? I often wonder what the reaction would have been at the Webcor factory if you'd told them that someone would be using this machine in the 21st century. My old man's machine. It worked the last time he tried it; I haven't yet. I'll write more when I do. If you think it looks filthy in the photo, you should have seen it before I cleaned it up.